This isn't just a recipe that lets you enjoy low-carb mac and cheese. It's also an easy and fast way to prepare spaghetti squash. Cutting spaghetti squash can be difficult, but the recipe below calls for the squash to be microwaved whole, making it soft and much easier to handle. And the cooking time is less than half the time it takes to roast in the oven. Once you've achieved perfectly cooked spaghetti squash, all those veggie noodles swim in a sea of cheesy goodness to soften them just a little more. The recipe takes another creative turn by piling everything into the empty halved spaghetti squash shells. It's so pretty, you may not even want to eat it for fear of disrupting the presentation – but you should. This is one great way to enjoy mac and cheese without any guilt about carbs. With a fork, poke holes all over the spaghetti squash. Place in the microwave on a plate to reduce cleanup afterward. Cook for 10 to 15 minutes, rotating every five minutes or so if the microwave doesn't have a rotating turntable. When the squash is finished cooking, remove it from the microwave and let it rest for about 10 minutes to allow it to cool enough to handle. While the squash is cooling, melt butter in a large saucepan. When melted, add the almond flour and whisk. Allow the flour to cook for a minute or so. Add the almond milk, whisking to avoid lumps. Remove from heat and add salt, pepper and cheddar cheese. 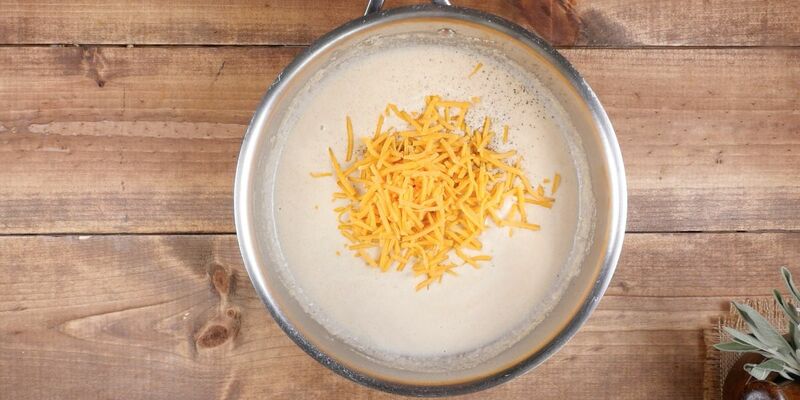 Stir until the cheese has melted. Place the pan back on medium-low heat. Carefully cut open the spaghetti squash, remove the seeds and, with a fork, pull along the sides to get the noodles out of the squash. Place the noodles in the cheese sauce and allow to cook for about 5 more minutes, until they further soften. 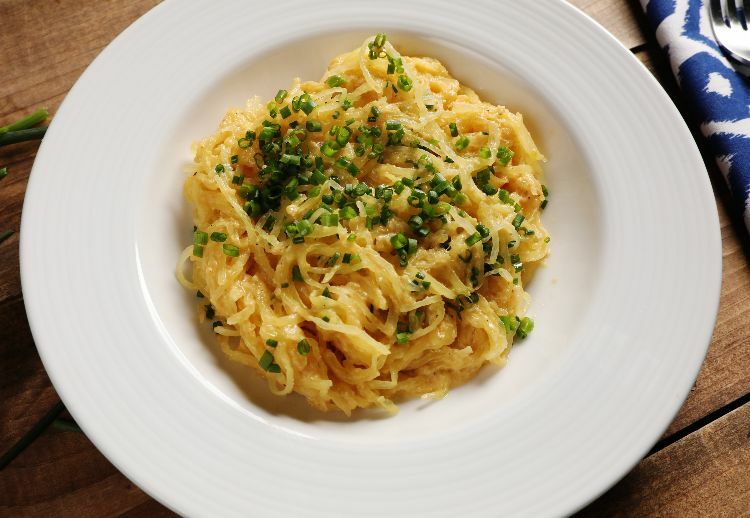 Spoon the noodles into the spaghetti squash shells and garnish with chives.